In 2011 producer Sara-Jane Hall and I won a prestigious Sony Award for 'Best Feature'. Since then the gods have continued to be kind and we have made programmes on a diverse array of subjects, including Ivor Cutler, public speaking, time travel, rural psychedelia, murmurations of starlings, weather divining and clapping. In June 2015 I was guest on Radio 4's The Museum of Curiosities with Sarah Millican and John Lloyd, choosing a component from a time machine as my object to donate to the museum. 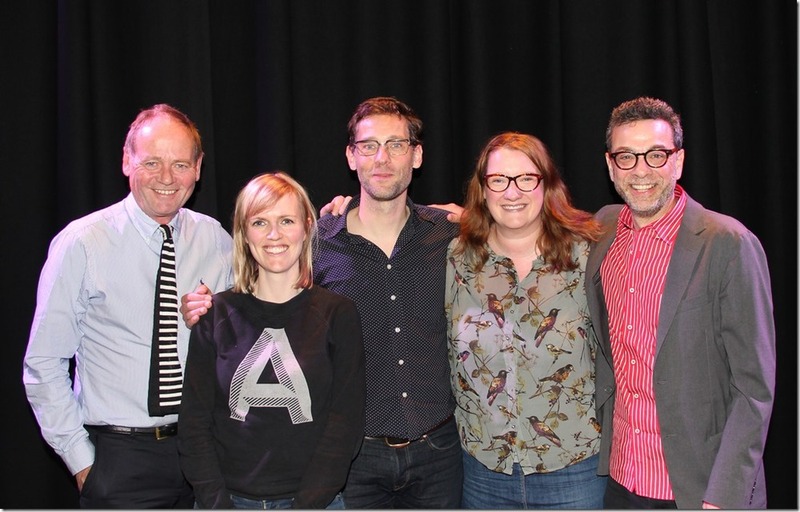 In 2016 I was twice guest on Radio 3's The Verb with Ian Macmillan, Radio 4's Saturday Live (I took some false teeth on the show that had been posted to me) and The Chris Evans Radio Show. Strong coffee helped for that one. Photos below (clockwise): learning Morse Code with Ivor Cutler's former partner Phyllis King, interviewing weatherman David King, sharing the Sony Award with Sara-Jane Hall, Drako (a guest in the Haunted Moustache programme), recording the singing plants in Damanhur and a group photo for The Museum of Curiosity.